Thomas Francis Pennefather BREEN M.B., B.Ch., B.O.A., L.M. Frank was educated at Belvedere College, leaving in 1900 he went onto Stonyhurst, the Jesuit boarding school in Lancashire. He then went to Trinity College, Dublin to study medicine, where he graduated M.B., B.Ch., and B.O.A. in 1912. He gained a commission in the Medical Services on the 30th January 1914 at the rank of Lieutenant, and on declaration of war went to the front with the 11th Field Ambulance - entering the war in France on 24th August 1914. He was present at the retreat from Mons and in the operations on the Aisne. *Around that time, he gave the following graphic account of the desolation wrought in France and Belgium by the German invasion at the beginning of the war, by which time his widowed mother had moved to Kensington in London: �People at home do not, cannot, realize what a war in one�s own country must mean. � It is very hard to convey in words what a country in which war is being waged looks like. The crops are left rotting in the fields; the oats fall and begin to sprout again. At any place where troops have bivouacked the fields are strewn with straw, old meat tins, remains of fire, etc. The roads, if the weather is wet, are torn up and turned into swamps, by innumerable guns, wagons and men. One passes through deserted villages or through places where the inhabitants stand among the ruins of their homes and of everything they owned on earth. Even in the places apparently undamaged they tell you �les Allemandes sont pass�s, et ils ont tout pris.� Every river has its bridges destroyed by either one side or the other. Trees have been cut down, fields and hills have been trenched. Every horse is taken and used for military purposes; troops are billeted in the houses; civilians, if any remain, are subject to most stringent regulations. There are ghastly stories of the way they have treated women. I have not the least doubt that many of them are lies, but they are not nice to think about.� (In a later letter he wrote that to his own personal knowledge many of the accounts of these atrocities were true.) * [* - Information taken from "The Cruel Clouds of War", kindly provided by Elizabeth Beveridge McLoughlin] Frank was promoted to the rank of captain on 30th March 1915, and served under the acting rank of Major from 4th January 1918 - 4th April 1918 and again from 5th September 1918. He was subsequently attached to the 1st Bn. 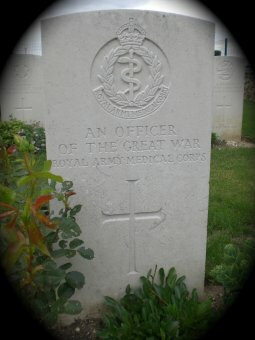 Rifle Brigade as Regimental Medical Officer, and later twice appointed Deputy Assistant Director of Medical Services. In 1918 he became attached to the 142nd Field Ambulance, and during the advance in autumn, 1918, when the Colonel was wounded, commanded the field ambulance during some of the severest fighting. He was still serving with this unit when he was killed whilst rescuing the wounded under heavy shell fire. The Colonel wrote to his family - �He died as he lived, an honourable, gallant gentleman. His coolness and bravery were known to all. It was, in fact, his zeal and unselfish devotion to duty that cost him his life..... I should like to say how much I valued him, both as a friend and an officer of the ambulance. He was absolutely fearless and self-sacrificing, and my last act, before being evacuated wounded from France, was to recommend him for a Military Cross.� One of his brother officers wrote: �He was very popular with everyone, and such a splendid soldier, his men would follow him everywhere.� And another wrote: �He was one of my most esteemed friends, though a good deal younger than me....... We were frequently under fire together, and I formed a very high opinion of his character, and looked upon him as one of the coming men of the R.A.M.C. One of his traits that specially impressed me was his independence of mind. He kept steadily to his own high standard...... quite regardless of the company he lived in..... Of his physical courage you will probably have heard from others,... but I write because I think that others, who did not know him so well as I did, may not have mentioned his moral courage, a rarer and a higher thing.� Frank was the elder son of Thomas John Breen, Inspector-General of Hospitals and Fleets, Royal Navy and Mary (Daughter of William Pennefather of Ballylanigan, co. Tipperary) of 15 Waterloo Road, Dublin.